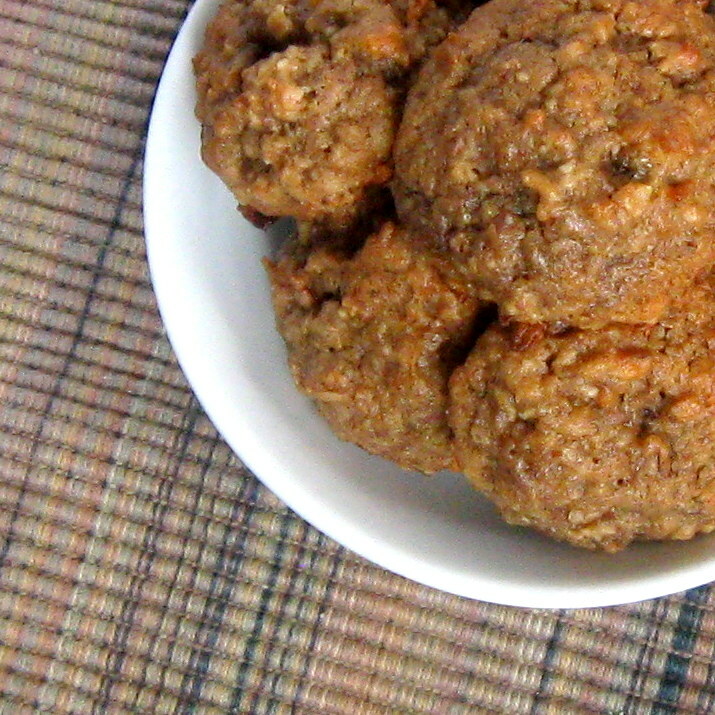 Peanut Butter & Banana Breakfast Cookies...a perfect take along treat! Cookies for breakfast is definitely the way to go! 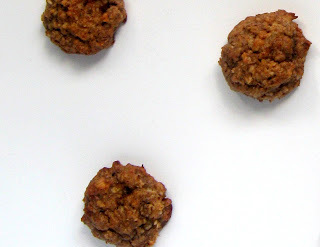 Especially if they are filled with peanut butter, bananas, flax seeds, and oatmeal. No eggs or milk here either. These are tasty little morsels (if I do say so) seeing as how I keep popping them in my mouth and I'm surprised there are any left. My intention was to make them for my son for his breakfast at school and he will have them for one day but I can't guarantee more than that. I'm always trying to think of new little breakfast treats to give him to eat in the mornings that will travel well and don't need to be refrigerated. These are healthy and small (about 2" each) so they're perfect. You could of course add raisins, cranberries, nuts, or chocolate chips but I decided to keep it simple. This is a pretty small recipe which could be great or so sad when they're all gone. I would rather make small recipes and try them out different ways than one big recipe and eat on them for a each day for a whole week or more. What I love about these is that there is no eggs, milk, or flour. There is some sugar but feel free to substitute honey for the sugar and omit the apple juice. I am out of honey for the moment so I was trying different ingredients. These are so quick and easy to make you will wonder why you didn't do it sooner. So go make some! Happy Baking! 2. 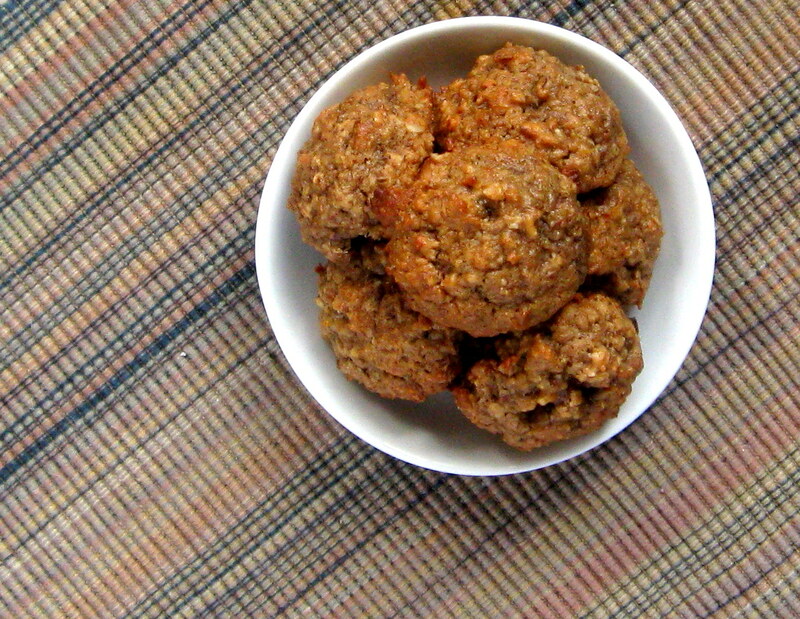 In a medium bowl mix together oats, flax seeds, cinnamon, baking soda, and sugar. Add the banana, peanut butter, apple juice, and vanilla. Mix thoroughly until the mixture is completely blended. 3. Scoop mounds about 1 tablespoon each onto a baking sheet. Bake 8-9 minutes or until lightly browned. Remove from oven, cool slightly then move to a cooling rack to cool completely. · DJ's Sugar Shack - Whatcha Whipped Up? What a great cookie! I love that I could eat it for breakfast!! Broccoli & Mushroom Rigatoni for Meatless Monday! Meatless Mondays! Ricotta Cheese please! I am in no way being compensated for any of my personal thoughts or opinions on this blog about any product unless otherwise noted.